− Thomas J. Watson, American Businessman & CEO, IBM. 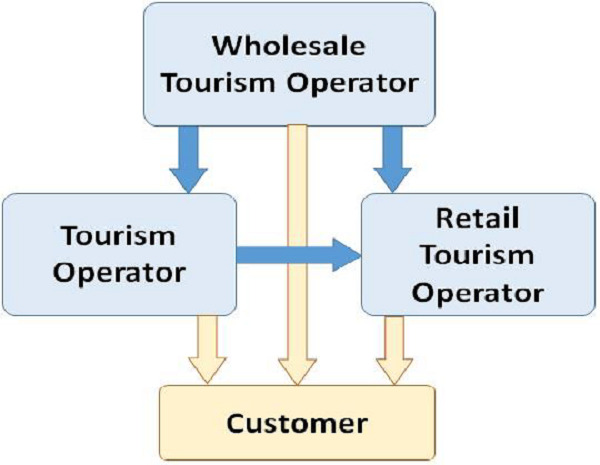 In this chapter, let us see the functional structure of any tourism business as an organization. Tourism is a large business in the service industry encompassing a wide range of activities and direct interaction with its customers. Who is a Tour Operator? A tour operator is business set-up or an enterprise which selects various components of tourism, prepares a tour product for a targeted market segment, plans itineraries, and conducts tours and promotions for the tours. The tour operator is responsible for booking the travel to the destinations, reserving accommodations, planning the entire tour in terms of what to see and do, and provide ancillary support to the tour. Cox and Kings, the longest established tourism business with headquarters in India provides services for outbound tourism and travel. Thomas Cook, a UK based travel company, established in 2007, provides a large array of travel and tourism packages. Kesari Tours and Travels, India offers group tours, specialty tours, and economy tours. Get America Tours, New York conducts year-round tours to majestic locations on both the east and west coasts of North America. British Tours Ltd, London offers personal tours in cars or mini buses in and around London with various themes. They buy services in volume from the suppliers and afford to sell them to the customers inexpensively. They provide service to the niche market that has interest in a particular geographical area or a special kind of activity. They provide multinational tourism. They take residents of their own country to visit another country or continent. They sell tour products or packages to the customers in their own country who wish to travel to another country. They provide trips within a country to the tourists visiting from other countries. They provide local assistance for the tourists arriving in their country. They are also known as receptive tour operators. These tour operators make the local arrangements for airport pickup and drop service, arrange for local attraction visits and activities, provide local guides, and are responsible for the tourists’ stay. They provide trips to the residents of a country within the boundaries of a country. They are also called resident operators. They have an upper hand to know the domestic seasons, culture, and food. They can repeat trips, sense the demand of local market, and suggest destination requirements to nearest DMOs. These tour operators sell the tourism packages directly to their customers bypassing the travel agent. They don’t pay the amount of commission to their travel agent hence, the customer can avail for a package at a lower price. In addition, the direct sell tour operators also can offer a large variety of destinations and packages. It is better to go for these operators if one wants to be very sure about the expectations to be drawn from a package. These travel agents are the face of main distribution channel for package holidays. They sell the tour operator’s tourism product in return for commission. Their commission generally ranges from 10% to 15% of the booking price. They are motivated to sell a product to earn commission and they are keen to attract repeat business. They setup a retail outlet, both shopfront and online; as an accessible place for their customers. Wholesale Tour Operators sell a product through established retail distribution channels, both shopfront and online. For example, Qantas Holidays, which negotiates product rates directly with suppliers and creates packages that are either distributed to retail tour operators (travel agents) or sold directly to customers via website. Similar to the retail travel agents, the wholesalers charge a commission of around 20%. Well Organized − To pass on the best possible experience to the customer, the tour operators need to have appropriate systems and processes in place. Best Networker − They make tourism better by building relationships with peer tour operators, contacting them in challenging situations as well as making liaisons when dealing with a tour. Friends with Technology − Learning and having strong hold on new technology creates an opportunity for a tour operator to reach customers, expose a wide range of tour products, and increase sales in less cost and time. Enthusiastic and Friendly − A tour operator must have enthusiastic and friendly attitude to create welcoming and interesting environment among the customers. Knowledgeable − The tour operator must be well-acquainted with the tourism products, destinations, attractions, and cultures. Let us now look into a list of reference material a tour operator uses at different stages of organizing a tour. Maps − They include world maps, state maps, city maps, cycle or walk maps, and road and rail maps. Event Calendars − They are both printed and soft calendars to schedule and keep track of tour dates, times, and other details. Brochures − They are used by tour operators to describe features of tour packages to their customers. Souvenirs − They gift the souvenirs to the customers as a token of remembrance of a place or an event. Promotion Material − Banners or PVC boards for messages, billboards brochures, cards, display stands of cloth or plastic to be used at an exhibition, escalator panels, flyers, Internet, interpretive panel containing orientation maps, picture maps, photographs, or diagrams as well as titles, introductory text, and contact information, leaflets, media advertising material such as images, audios, and videos.